Act now: Southern Oregon Tasting in Portland Tomorrow! Readers of The Oregon Wine Blog...we have a special opportunity for you today and today only! Tomorrow, the Southern Oregon Wineries Association will be hosting a tasting at The Governor Hotel in Portland, OR. Below, you will find promotional material for the event. Tickets are still available online (until 10 AM on Sunday) with a limited number at the door. But wait, there's more! This is your opportunity to be a guest of The Oregon Wine Blog at this event! The first reader to email me with their full name and favorite Southern Oregon wine will receive 2 tickets to this event free of charge. All that we ask in return is that you send a brief review of the event to us for posting. Don't worry if you aren't a writer, our writing isn't that good either. What are you waiting for? Oh, and if you aren't the first to email me, see below to purchase tickets. Join us for Portland biggest wine events of the year! Last year over 400 enthusiasts experienced an exciting array of Southern Oregon wines which are now finally receiving national acclaim. While you may think Pinot Noir is Oregon wine, that will change after you experience this tasting! Southern Oregon is producing some outstanding wines and a wide range of varietals! The wines and winemakers of Umpqua and Rogue River Valleys come to us in Portland, and you can save the gas money from driving down south and check put the best the area has to offer including: Albarino, Viognier, Pinot Gris, Roussanne, Syrah, Tempranillo, Zinfandel, Malbec, Cabernet Sauvignon, Cab Franc and some eclectic red blends - all atThe Governor Hotel in Portland. At only $35 it is a fantastic deal. Tickets include light appetizers by Jake's Grill and unlimited tastings of over 100 wines from 28 wineries. Bottle sales are also available at the event! For pictures from last years event click here! about the wineries featured at our 2009 event! Today, as an interlude to the Non-Traditional Wine Series, we bring you a post that we have been excited about for quite a while...one that has been waiting for the perfect moment to write. It's like the Catalina Wine Mixer, for all you Will Ferrell fans. That's right, friends, the Catalina Freakin' Wine Mixer. We bring to you a portrayal that will certainly not do justice to both a wine and an experience that is second to none: Col Solare. We fell in love with Col Solare a few months ago as previously chronicled, so when presented with the opportunity to do a private tasting at the estate in August you couldn't get me in the car fast enough. For the time being, I'm going to focus more on the experience than the wine, but rest assured there's a glass of 1998 Col Solare in my hand right now as I write that we paired with pumpkin gnocchi and halibut cheeks. It's amazing. As some background, Col Solare is a fascinating partnership between Chateau Ste. Michelle in Washington and the Antinori family from Tuscany. Formed with the intent of making Washington's best cabernet based wine, they certainly have hit the map in a big way by combining old and new world styles. In 2008, Col Solare opened an estate on Red Mountain, and winemaker Marcus Notaro put out the 2006 vintage as the first from that facility. 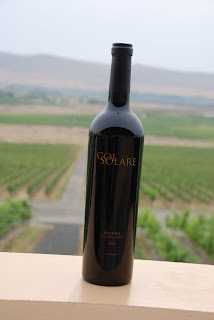 On The Oregon Wine Blog's Eastern Washington wine tour this summer, Col Solare was first on the agenda and set the standard for the rest of the trip. All we knew going in was that we were to meet Wendi Warner, the winery manager, at the estate at 1:30 for a tasting and tour. Before we passed through the gates, it was obvious that this estate was different, unique, and special. Literally on the top of Red Mountain, the Col Solare tasting room (including a barri cai and winemaking cellar) overlooks many of the vineyards it sources from on the mountain. A 300 foot stone and concrete wall line the 30-acre estate vineyard, consisting of predominantly of six unique clones of Cabernet Sauvignon, along with individual blocks of Merlot, Petit Verdot, Malbec, Cabernet Franc and Syrah. We were quickly met by Wendi and engaged in perhaps the most enjoyable hour and a half of wine I've experienced. As Wendi took us through the vineyard, production area, winemaking cellar, and barrel room, it became apparent that not only had Col Solare committed to making Washington's best cabernet based wine, they also put their money where their mouth was. Immediately evident was the presence of a true hospitality professional in Wendi as manager. I made a mistake in coordinating arrangements with the Chateau Ste. Michelle public relations staff and we showed up with one more staff member than originally anticipated, and Wendi gracefully covered for it without batting an eye. In fact, the two colleagues I was with didn't even know I had made a mistake she did such a phenomenal job. The staff is just the beginning. The devil is literally in the details and Col Solare takes NOTHING to chance in ensuring they are producing the absolutely best wine possible. Col Solare is special in so many ways. The location of the estate vineyard, which should produce it's first vintage within a years, was specifically selected to capitalize on the airflow off of the Yakima river on Red Mountain. The vineyard blocs were laid out in a way that takes advantage of the sun rise and set pattern based on the needs of the grapes. The grape press is specialized for Col Solare and the rest of the equipment is brand new, top of the line. Even the split of the vines is unique to produce the best quality fruit. Winemaker Marcus, who we were lucky enough to meet on our tour, has first selection of fruit from the Chateau portfolio, in addition to sourcing from the best vineyards in the state. Even the winery is designed to look like a graphic image of the sun, as Col Solare is Italian for shining hills. To make a comparison, the Oregon State University two-time NCAA champion baseball team finds success using a philosophy of "small ball". It's one play at a time, fundamentals that make for an overall win. Col Solare pays attention to every single detail, producing a wine of synergistic effect. Our tour with Wendi ended with a sampling and formal pairing. A tasting at Col Solare isn't just a tasting, it's another example of attention to detail and a quest for excellence. Wendi took us through the 2005 and 2006 vintage, paired delectably with 6 local cheeses selected specifically for the vintages. Ranging from a smokey blue to an irish porter to a coastal cheddar, Wendi expertly helped us navigate the different notes of the wine that the cheese accentuated - all the while taking our feedback and opinions to heart. And really, how can you beat an ambience where every time you look up from your delicious wine and cheese you are looking through a glass window into the barrel room of a world-class winery? Would it be too over the top if I said again how amazing this experience was? As we preach here on the blog, wine is as much about the experience as it is the wine, and Col Solare has hit a homerun on both accounts. The estate is definitely one of the best kept secrets on Red Mountain. They are open to the public, by appointment only, and for $55 per person you can have same formal pairing experience I just described. While our tasting was comped by the winery (hey, there are a few perqs here and there to our hours of labor drinking wine), I PROMISE you it is worth every penny and more. It is a must see next time you are in the Red Mountain area, and if you run across a bottle of Col Solare in the store pick it up. At a price point of around $75, it is tailor-made for those special dinners and with a consistent 92+ rating it is sure to please. For more every day drinking, Col Solare makes a second label in Shining Hills. Haven't tasted it yet, but there is a bottle on the shelf. Oh, and in case you were wondering, the 1998 was wonderful with an outstanding balance, smooth intake, and slightly spicy finish. Cheers...and what are you waiting for, book your trip to Eastern Washington! While it is a departure from the blog’s current series of reviewing non-traditional varietals, for my debut on The Oregon Wine Blog, I wanted to review a Washington wine that’s made on my side of the Cascades, at Woodinville’s Di Stefano Winery. Woodinville is just a short drive from Seattle, and is home to some of Washington’s best wineries - and certainly some of my favorites. It would be a misnomer to call Woodinville a wine region, as all of the wineries grow their grapes in the much warmer climes of Eastern Washington, but Woodinville is home to more than 45 wineries. Di Stefano sources grapes from the Columbia and Yakima Valleys and they’ve been making wines there since 1993. The 2004 Sogno is Di Stefano’s Cabernet Franc and is 91% Cabernet Franc and 9% Cabernet Sauvignon. I think Cabernet Franc is a vastly underrated varietal, and while I never tire of drinking Cabernet Sauvignon or Merlot, I confess I’d like find a Washington Cab Franc with a bit more regularity. Let’s get down to drinking, shall we? The wine is a beautiful dark ruby in color, with a nose of cherries and smoke. We drank this wine over the course of a night, and it initially seemed to lack the complexity you’d hope for in a Cab Franc. Later in the evening, the wine really opened up and it was quite a treat. It was very earthy, with ripe berry flavors and spicy pepper notes. The wine was very smooth - almost surprisingly so for a Cabernet Franc - with a medium body and well-balanced tannins. Like many wines at grocers this time of year, this wine can be found for a steal at under $20 a bottle. I’d recommend this Cab Franc as well as the Di Stefano Meritage of the same vintage. I’ve not been to the Di Stefano tasting room but with quality wines like this I see a trip in my near future. I’m excited to be a part of The Oregon Wine Blog, and I look forward to bringing you more on the wonderful wines of Washington, whether its Walla Walla, Yakima or right up the street in Woodinville. As Seinfeld put out 9 seasons of a show about nothing, this is a post about nothing. Well, not really nothing, more so a bunch of random things that we call "filler material" in the industry. Really what I'm trying to say is that we haven't made a post in a couple of days and probably won't within the next few days so I feel the need to post something so you don't think we're dead, drunk, or have quit blogging in protest of some unidentifiable event. You get the point. 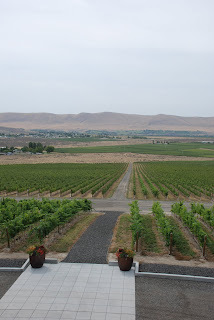 First, I will be heading to the Yakima Valley tomorrow for non-wine related purposes...but like any good wine blogger will have some time on my hands to do a little tasting and take in the scene. Check back for a full report in a week or so, but in the meantime, does anybody have tasting and dinner recommendations (preferably in walking distance of the Red Lion Yakima Center)? Second, I'd like to direct your attention to a post on Fermentation: The Daily Wine Blog, discussing a new Federal Trade Commission regulation requiring bloggers (of the wine variety) to disclose when wine sampled is provided free of charge to the blogger. Actually, the regulation is a bit broader than just wine and blogs, but the rub is that the same sort of disclosure is NOT required of traditional media. Interesting discrepancy highlighting the battle between new and old media. Check out the post, oh, and The Oregon Wine Blog does at times receive samples, discounts, and entrance into events gratis. We try our best to always disclose if this has been the case. Finally, stick with us as we have a ton of exciting posts coming up. Still in the barrel are an overview of the state fair wine competition, a continuation of our series on non-traditional wines, some follow-up coverage to the recent Red Mountain / Walla Walla trip, and some book reviews! Ladies and gentlemen...boys and girls...The Oregon Wine Blog brings to you the next varietal in our lineup of non-traditional wines from the Pacific Northwest: Petit Verdot! As always and to be as accurate as possible, we have decided to consult the most accurate source of information in the world: Wikipedia. Did we mention how accurate it is? Petit verdot is one of six red wine grapes typically used in bordeaux-style blends. 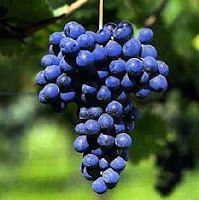 Typically used as a blending grape, petit verdot tends to ripen much later than other grapes in southern France and typically used in only small amounts. While this may be unappealing to French winemakers, those of us in the United States have benefitted from a varietal that is known to ripen much more consistently and requires less attention to grow. Fun fact: "It is also planted in a small way in Colorado, Texas, Virginia, Missouri, and Washington." In short, making pure varietal petit verdot is a relatively rare practice. The temperance of this grape in its native region made it inconvenient at best, but brave winemakers in many of the New World regions have discovered that this grape can hold its own at times. Mike Conway from Latah Creek Winery in Spokane, Washington was kind enough to send us the only sample of Petit Verdot we received for this series: 2006 Latah Creek Winemaker's Reserve Red Petit Verdot. 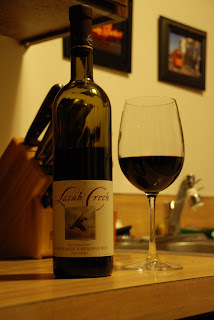 You may be thinking to yourself: "But wait, I thought Latah Creek did dessert wines?" Well, that is probably because 50% of their production annually is dedicated to an excellent Riesling and Huckleberry d'Latah; however, to not delve into their would be to deprive yourself of a some excellent small-lot production wine. The Petit Verdot is the first in Latah Creek's series of Winemaker Reserve Reds, a grouping of "intriguing, small lot, reserve quality wines" commemorating the 25th anniversary of the winery. That's right, 25 years in Eastern Washington! Conway was one of the early founders in the Pacific Northwest, starting as the winemaker at both Latah Creek and another little winery you may have heard of -- Hogue Cellars. Immediately upon pouring this 100% Petit Verdot, we noticed a dark black cherry color. The nose fell somewhere between that of a cab and syrah, giving off notes of dark red fruit, blackberry, and currant. It was "yummy", although the tasting notes also indicated espresso on the nose that we couldn't pick up. Probably one of the most prominent, awesome qualities of this wine is the luscious mouthfeel. Silky is the word that encapsulates this wine, and we felt a bit misled by the nose (in a totally good way) by the smoothness of the verdot. With flavors of mixed berries and a spice on the finish, this wine was a very pleasant surprise. Pleasant enough that I'm getting ready to pour another glass. As we had a spicy korean dish for dinner tonight, we decided to do the wine solo -- and it totally worked. As good by itself and it would certainly be with food, we can see this pairing well with a savory meat dish such as herbed lamb. Its big enough to stand up to strong flavors but the flavor doesn't overpower the palate like a syrah or merlot can. Latah Creek hit a homerun on this wine. With only 340 cases, we'd advise picking some up before it's gone at $30 per bottle. If you miss out, though, don't worry -- Latah Creek has a nebbiolo, cab franc, and temparnillo coming up.